It’s hard to overstate how important purchase orders (POs) are to growing retail businesses. From tracking orders to monitoring profits and managing cash flow to increasing sales, they play a pivotal role in enhancing daily operations. Here are our top 13 reasons you should be using POs right now. They’re easy to get started with—and worth any effort. Simply put, they’ll make your whole company run more smoothly. Keep it all in writing. A critical part of every retailer’s day-to-day business, purchase orders (POs) establish a legal contract between you and your suppliers, and document important information like quantities, prices, and timelines. If problems arise down the road, you’ll be in a better position if you have a written PO than just a verbal agreement. The most fundamental task of POs—and a great reason to use them—is to help you keep track of what you’ve ordered. When you enter them into your system, you gain instant visibility into what products are coming, in what quantities, and when. Make sure you record your POs when you order the products, not when they reach your door. And send copies (as PDFs, which can’t be changed) to your suppliers at the same time to make sure everyone is on the same page. POs make checking-in new shipments easy. They make everything clear—even when the person receiving the delivery isn’t familiar with the order. The person simply cross-checks the shipment against the PO, catching problems easily so the supplier can be notified immediately. This is especially important when you need to make sure a shipment is correct right away—like when a customer is waiting for the entire order or the supplier only gives you 24 hours to report delivery problems. It often takes multiple shipments for suppliers to fulfill an entire order. No problem. If you manage your supply chain using POs, anyone on your team can easily track what has been received and what hasn’t. This makes it easy to check daily on back orders so you can remind your suppliers about any outstanding items. If your products don’t come with bar codes on them, adding the labels yourself can be daunting—unless you have POs in your system. If you do, it’s easy to print the right number of labels and apply them as you check-in the products. In addition to recording the quantities you order, POs also document the prices you agree to pay for each product. When both you and the supplier have a copy of the PO, there will be no question about what the invoice amount should be. If your supplier later sends you an invoice for quantities you never received or for a different amount, you’ll spot it—and be able to resolve it with them—right away. By creating POs in your system, you’ll be able to see what you have on order at any time—so you can avoid overlapping orders and ordering more of a product than you need. Keep upcoming expenses in sight. By entering POs into your system, you’ll be able to keep track of the exact dollar amount you owe for products that are between ordering and invoicing, such as those that have just been shipped or delivered. Always knowing this amount is critical for inventory and cash flow management, as well as for closing the books at year end. Plus, auditors often require it. View actual profits any time. To stay on top of your Profit and Loss Report, you need to know your actual cost of sales—and POs make that a lot easier. In a fully integrated system with up-to-date POs, the cost of sales is taken from the actual value of the products shipped to customers. Any changes to the dollar amounts for received products and invoiced products are automatically accounted for, so both your cost of sales and your Profit and Loss Report are right on. Automating all of this also saves your accountant a lot of time, which can save you a lot of money. Using POs gives you a trail of invaluable information about past purchases. You can monitor—by brand, supplier, or product line—what you bought last year, what products sold well, what you paid for them, and how fast the supplier delivered them. Armed with this information, you’ll be in a better position to negotiate a supplier discount or place next season’s orders. The purchase order history also speeds up everyday tasks like checking on problem deliveries or tracking shipments. And you can see what your inventory costs you—and which products are becoming prohibitively expensive. Sales people need to know what products are available—and will be available soon—to sell. A great way to provide this information is to give them access to your system with up-to-date POs and delivery dates. If you’ve run out of a product, but they can see that 100 more are due to arrive tomorrow, they are empowered to make more sales. Make past suppliers readily available. For employees who need to order products for customers, information stored in a PO system is indispensable. Even if they’re new—or you have tens of thousands of SKUs—it’s easy for anyone to look at the system to see who you’ve bought from in the past, so they can place the order—and make the sale—quickly. Delegate to grow your team. Perhaps most importantly, creating POs and entering them into a central system enables your whole team to share responsibility for your inventory and sales. It gets order information out of one person’s head and creates a safety net for when someone makes a mistake or is ill or on vacation. The more people working together from shared information, the better for your employees and your business. 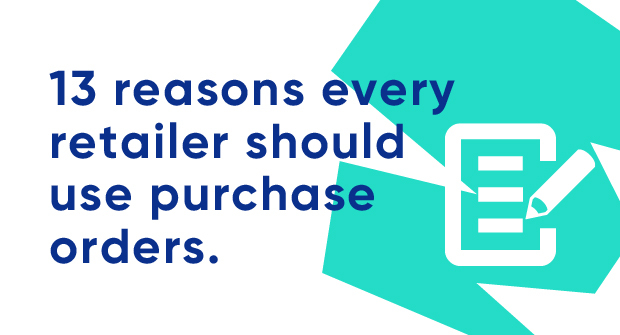 There you have them: 13 solid reasons to use POs. Every one of them makes good business sense. But there’s a bigger reason, one that’s near and dear to our hearts at Brightpearl. If you do, the POs and the system they’re in will handle a lot of details, giving you time and mental space to do what you love—grow your business.